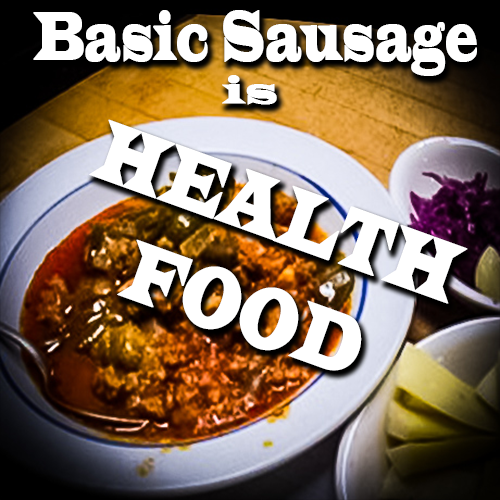 Did you know that “Basic Sausage” is a Health Food! Awesome, right? Let me tell you how I make it. Sausage Stew, hard cheese , raw red sauerkraut and Fermented garlic. Sage will help prevent Diabetes. This spice can calm intestinal spasms and treat gas problems. It has antimicrobial benefits, and is also a brain food. Although red meat has had a lot of bad press over the last 50-years, pork has many health benefits. It is loaded with nutrients that we need and haven’t been getting in our diets. Pork contains Iron, Magnesium, Omega 3s, and Protein therefore this meat is a body builder’s delight. I sleep well when I eat unprocessed pork for supper. I bought three pounds of good, basic pork sausage and fried it for snacks. Big problem: I added too much of my beloved SEA SALT, and too much plain old SAGE. I decided to save the week’s food supply; I added three flavorful yellow onions, a pound of green peppers from my freezer, and quart of tomato sauce (tomato, basil and garlic) from Sam’s. I partial out the “King’s Feast”, into freezer bags, three meals per bag. Now I can keep this in the freezer for at least a month or two. When I thaw this food, I can dine for a week on each package. Side Meal of Hard Cheese, Raw sauerkraut, Fermented. garlic, makes this an even more healthy meal.